Create extreme matt and rough, textured styles with great control. Indola Innova Texture Style Rough Up represents step #3 in the Indola Innova Texture hair care programme. 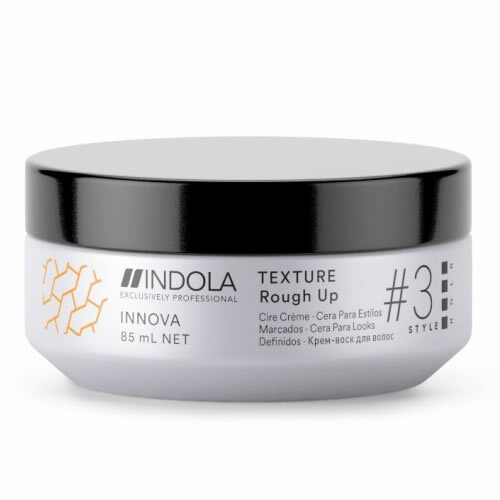 It's an amazing wax cream that offers great control when creating rough, textured looks for your clients. It creates an extremely matt look and also contains Indola's pixel technology that has a UV-filter to protect against UV-rays. £1.50 (inc. VAT) Why no VAT? We're a trade wholesaler and quote our prices without VAT to help our VAT-registered customers understand the true cost of a purchase. Colour-enhancing shampoo that helps lock colour into hair for up to 90% colour retention even after 30 washes. Comes in 3 sizes: 50 ml, 200 ml or 1500 ml. Last few 300-ml bottles in old packaging also available (product unaffected). Reduced to clear! This is a fabulous conditioner which is found in a box of hair dye. Its used a a sealer to seal in colour but conditions the hair like no other product.